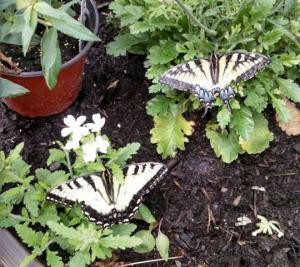 George and Anne Morse have owned Butterflies of Cape Cod, located at 26 Herring Pond Road in Bourne, for 8 years, and each year the attraction seems to get more popular, as repeat visitors come and more people hear about their butterfly house. The couple purchases and raises butterflies for the house, which is open daily from 10am to 5pm from late May to September. The best days to come to the butterfly house, according to George, are sunny days, because the butterflies do not fly on overcast and rainy days. The butterflies in the butterfly house are all native, which is different from most butterfly houses in the US which tend to feature tropical butterfly species. George says that it can be interesting for visitors because they will get to see and learn about butterflies that may be in their own backyards. The couple raises about 12 different species of butterflies throughout the season, according to George. The house itself has screen walls and a solid roof, and features plants and walking paths. Visitors are welcome to read the educational material on-hand about the butterflies. The gift shop also sells a variety of butterfly related gifts and educational material. The largest butterflies in the house, according to George, are some of the species of swallowtails, who can have wingspans up to 4 inches, followed by the monarchs who can have wingspans from 3 inches to 3 1/2 inches. Admission to the butterfly house is $6 for adults, $5 for seniors, and $4 for kids. For more information, call 774-413-9310. If you love butterflies, you will love the Butterfly House in Bourne. Facebook photo.